The sound of elegant, expensive Waterford crystal smashing on cement is bone-chilling. Beauty is being destroyed, but it's for the right reason. At the Waterford Crystal factories, nothing less than perfection is allowed to be processed for sale – and pieces that don't make it hit the deck. The perfection of each Waterford item has been the hallmark of this centuries-old company since its beginning in the late 1700s. As fabricators around the world reproduce copies of the real thing, buyers need to be aware of the qualities that distinguish original Waterford crystal from the many imitators. The Waterford stamp is found under the base of authentic glasses. While crystal is glass, not all glass is crystal. In 1600s London, glassmaker George Ravenscroft introduced lead into the glass melting process. His tinkering with the metal-glass mix resulted in lead crystal – a "crystal"-clear, strong, durable compound that chimes when tapped with the fingers and feels warm in the hand. Glass cutters, noting the strength of lead glass, began embellishing heavy pieces of it with intricate patterns and shapes. Waterford crystal exemplifies such patterning in fine, hand-cut lead crystal. Unlike lightweight glass, lead crystal is heavy. When holding a piece up to the light it should be perfectly clear – a silvery-white. Regular glass produces a yellow or green tint. The bases of most Waterford crystal have the word "Waterford" etched on the underside. Older Waterford crystal carried a green and gold sticker with the logo. However, this may have been removed after years of wear. 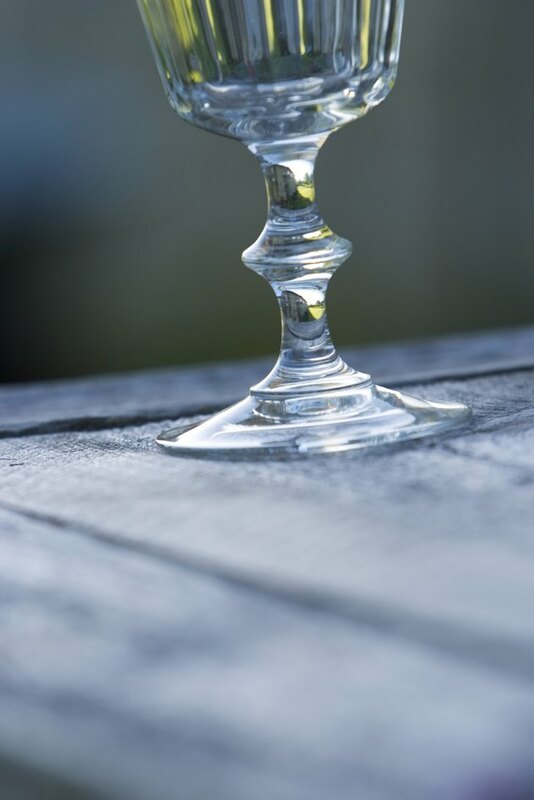 Since 1950, each piece of Waterford crystal has been stamped with the company logo. Resembling a stencil pattern, the Waterford name is slightly opaque. On a wine glass, it's found on the underside of the base. If the piece is older, a magnifying glass may be necessary to find the stamp due to wear. In 1987, a stamp in a script font was created, making it easier to fit on pieces with little room for stamping. At the end of the 20th century, to commemorate the millennium, Waterford incorporated their seahorse logo into the stamp. The tail of this seahorse curls outward and counterclockwise, and a shamrock is formed within its center space. The hallmark of Waterford crystal is the complexity of the cut and the soft, rounded edges of each element in the design. No sharpness is found within the pattern; the fingers glide smoothly from one shape to the next. With light reflecting off each facet, Waterford pieces sparkle. While multiple patterns inherent in only Waterford crystal are produced, there are still replications and forgeries out there – but the quality of cutting is what sets real Waterford apart from the fakes. Verify a Waterford pattern with a reputable dealer before purchasing a piece. Once made exclusively in the town of Waterford, Ireland, the now American-owned company also includes factories in Slovenia, the Czech Republic and Germany. If the piece was made in any of these four countries, it's more likely to be an original. The country of origin is printed on the box label. As of this writing, no other country has a factory licensed to manufacture Waterford pieces. The Waterford Crystal gray-and-white box also carries the seahorse logo above the registered Waterford name.